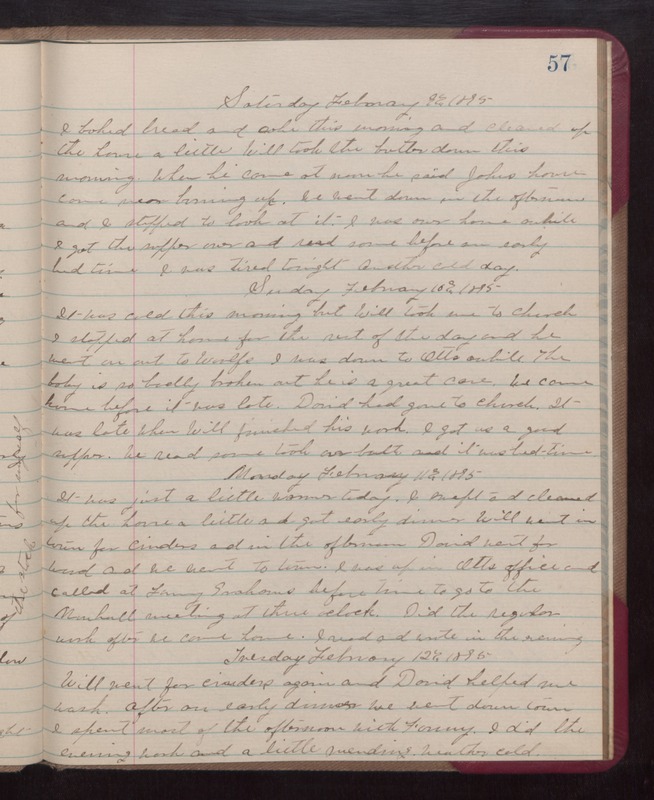 Saturday February 9th 1895 I baked bread and cake this morning and cleaned up the house a little. Will took the butter down this morning. When he came at noon he said Johns house come near burning up. We went down in the afternoon and I stopped to look at it. I was over home awhile I got the supper over and read some before an early bed time. I was tired tonight. Another cold day. Sunday February 10th 1895 It was cold this morning but Will took me to church. I stopped at home for the rest of the day and he went on out to Woolfs. I was down to Otts awhile. The baby is so badly broken out he is a great care. We come home before it was late. David had gone to church. It was late when Will finished his work. I got us a good supper. We read some took our bath and it was bed-time. Monday February 11th 1895 It was just a little warmed today. I swept and cleaned up the house a little and got early dinner. Will went in town for cinders and in the afternoon David went for wood and we went to town. I was up in Otts office and called at Fanny Grahams before time to go to the [Marhall?] meeting at three oclock. Did the regular work after we come home. I read and wrote in the evening. Tuesday February 12th 1895 Will went for cinders again and David helped me wash. After an early dinner we went down town. I spent most of the afternoon with Fanny. I did the evening work and a little mending. weather cold.